A disappointing showing in front of the Sky cameras saw Blackpool go down 3-1 to a superior Burnley side on Saturday evening. It was a poor performance which will only fuel the negative atmosphere currently surrounding the club. Here are my thoughts about the weekend’s match. From a Blackpool perspective, the build-up to this game was somewhat low-key. Considering the two sides hadn’t met since the 2008/09 season, the anticipation among the ‘Pool support for this Lancashire derby hadn’t exactly hit fever pitch. Whether that transmitted to Ian Holloway’s players is unclear, but it was the men in claret and blue who looked by far the hungrier of the two sides. Suggesting a team simply ‘weren’t up for it’ is something of an cliched English approach to football, but on this occasion it seems a fair comment. From the off the Burnley side looked to harry their opponents and frequently pressured the visitors into making a lot of mistakes. Burnley’s running off the ball was relentless and ‘Pool struggled to get to grips with the high tempo of the game, often finding themselves caught in possession. In contrast, ‘Pool didn’t exert the same pressure when the home team had the ball. It was a frustrating viewing experience for Blackpool fans and aside from a couple of early runs from Tom Ince, there was little to set the pulse racing. This is by no means an all-star Burnley line-up – their stuttering form so far this season indicates their present mid-table position is about right, but they gave ‘Pool little opportunity to demonstrate any quality that the visitors may believe they have. Time on the ball was at a premium and Burnley’s constant pressure made Blackpool resemble a team of near strangers destined for a long old season. It has been a bugbear of mine since last season, and eventually Blackpool’s lack of concentration from a corner kick has cost them a goal. Set-pieces seem to be a recurring frailty for the Seasiders, but incidents like this should be cut out altogether. The premise is simple, if the opposition goes to take a short corner involving two players, the defending side needs to send two players 10 yards from the corner flag, in order to successfully close down a one-two between the attacking players. 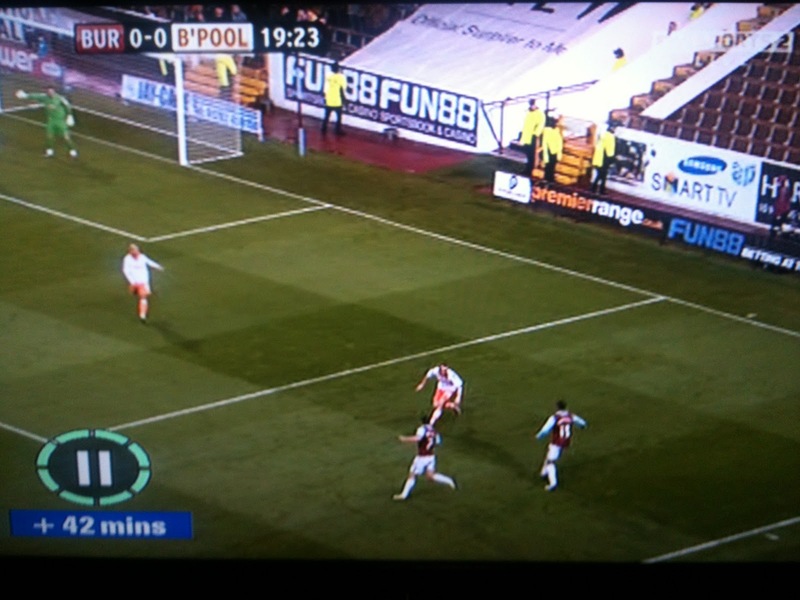 On this occasion, the corner that led to Burnley’s first goal, only Brett Ormerod was nearby as the hosts worked a short corner. On his own, Ormerod was unable to prevent the cross after Ross Wallace passed to Junior Stanislas for a short corner. The cross came in and Charlie Austin beat Craig Cathcart to the header – 1-0. In the stands, it was Cathcart who shouldered a fair amount of the blame. Cathcart was too easily shrugged off sure, but the cross should never have been allowed. Had the corner been put in directly, it’s an easier ball to defend as it’s usually heading away from goal, meaning it’s more difficult for attackers to put a run on their marker. In this instance, the guilty party is surely Kevin Phillips, who as seen below is slowly wandering over to the corner, but only once it is too late. Phillips was surely tasked with being the second marker on the short corner, but a lack of concentration handed Burnley the initiative. Brett Ormerod is forced to track Ross Wallace’s run, allowing Junior Stanislas to cut back and deliver the killer cross. Kevin Phillips (top left) arrives on the scene too late. Going into half-time two goals down, the performance had been so sub-standard that it was difficult to imagine what changes Holloway could make to turn things around. With so many players having an off-day, picking just three to haul off was a tough choice. As it happened, the manager sent the same 11 players back out in the second half, faced with the daunting challenge of salvaging a result. The shape of the team was different however, and not for the first time in recent weeks, Holloway changed to a 4-4-2 – Ince went wide right, Jonjo Shelvey wide left, with Brett Ormerod partnering Kevin Phillips up front. The tactical change was not a complete success, but Blackpool did begin to create chances having drawn a virtual blank on that front in the first 45 minutes. Ince and Shelvey created more width, and Callum McManaman also looked a threat when he came on with 20 minutes to go, but the front pairing of Ormerod and Phillips struggled badly, the latter especially. It was no surprise when they were both taken off, but the change could easily have come sooner. Whether the marginal improvement was down to the shape is unclear – some players were better after the break while others were just as bad, if not worse. Ian Holloway has been a big exponent of the 4-3-3 formation since being appointed Blackpool manager in May 2009, but his use of the 4-4-2 lately demonstrates one of two things, depending on your viewpoint. A willingness to change when necessary would be one outlook, but one could equally view it as a manager confused about the direction his team is going. I would suggest that there isn’t necessarily a need to re-invent the wheel by changing philosophy, rather a need to identify the core group of say 16 players Holloway can rely on, and build some continuity into the side. Back to the shape however, and the balance of the midfield hasn’t quite been right all season – it remains to be seen if Keith Southern and Barry Ferguson is viable in a three man midfield (or for that matter, a two man central midfield). Holloway’s decision to leave out Southern against Nottingham Forest indicates he too has concerns in this area. Having switched to a 4-4-2 midgame on a couple of occasions now, it may only be a matter of time before ‘Pool begin a game with that shape – rightly or wrongly. Gary Taylor-Fletcher, while hardly an out-and-out target man himself, was a big loss for the Seasiders and his absence displayed what an influential player he is. Blackpool do have a tendency to go long with their passing using the diagonal ball, but without Taylor-Fletcher present, it was a thoroughly unrewarding tactic on Saturday. The resultant effect was conceding possession on a regular basis, with none of the forward line able to effectively hold the ball up. In terms of Taylor-Fletcher’s own form this season, it has wavered, possibly down to the variety of roles he has been asked to fill, but he remains a key cog in the machine. Missing through injury, the loss of Taylor-Fletcher again highlighted a failing in Blackpool’s transfer policy this season. For all the players that have been signed – 17 in total – and the size of the squad, the loss of one player was too crucial and shows that despite the numbers it’s hard to make a case for genuine strength-in-depth. There are too many similar players in the squad, and perhaps more alarmingly, too many who are unlikely to ever feature despite being signed only a few months ago. Comments made this week by the manager and his assistant indicate that they perhaps are now aware of mistakes made, but it will be interesting to see if they can rectify this situation to any great extent before January. A big target man may not be the Spanish way Holloway admires, but in a league such as the Championship it is a weapon that Blackpool need to have in their armoury. For the time being, a speedy recovery for Taylor-Fletcher is key. In the opening 45 minutes at the Boleyn Ground Blackpool saw plenty of the ball, particularly early on, but were still rather fortunate to be going in only a goal down. It was actually ‘Pool who started the brighter team, with West Ham forced to watch as the visitors barely gave them a kick of the ball in the early exchanges. Tom Ince, making his second league start, was impressing down the left and combining well with Stephen Crainey and Jonjo Shelvey in the first 10 minutes, but unfortunately for the Seasiders they were unable to create clear-cut chance while they were on top. With the Hammers’ first real attack, it was 1-0 against the run of play. Rocked by conceding, Blackpool’s early dominance faded and the game became a much more even affair. ‘Pool were still having more than their fair share of possession, but the best chances went the way of the hosts. The effectiveness of Tom Ince was severely reduced when he moved over to the right – once again the idea behind inverting the wide players must be questioned. As a tactic to confuse the opposition on an infrequent basis it’s fine, but when a player spends most of the game on their unnatural flank, something does not add up. Barry Ferguson and Keith Southern had a lot of touches of the ball in the first period, but finding their way past a resolute West Ham defence was proving tricky. The Hammers were happy to stifle Blackpool and wait for the mistake, pouncing quickly to threaten adding a second on a few occasions. Matt Gilks was rather busy in front of the Blackpool fans during the first half, including one excellent save with his feet to keep ‘Pool in the game. The big talking point in the aftermath of Saturday’s defeat was the selection of Matt Hill at centre back. An injury worry for Craig Cathcart saw him miss the game, but eyebrows were raised when it was Hill who came in to replace him. When the teams were announced, the prospect of seeing Hill come up against John Carew was a worrying thought, and so it proved as Hill had a day to forget. It was actually Ian Evatt who lost Carew for the first goal, but Hill had the (rather bizarre) responsibility of marking a player around a foot taller than him for the rest of the game, unsurprisingly never looking comfortable. Hill was lucky to get away with two heart-in-mouth moments during the first half when he inexplicably dallied on the ball twice presenting the Hammers with two great chances – fortunately for Hill he had Matt Gilks behind him to come to his rescue. Perhaps feeling sorry for him, the referee gave a couple of soft free-kicks Blackpool’s way in the first half – the sheer mismatch in size maybe fooling the officials into thinking Hill was being fouled by Carew when the Norwegian’s challenges were probably fair. With the number of chances West Ham had in the first half, they were unfortunate not to have a bigger lead, but it was surprising to see Hill re-emerge for the second half when it was clear for all to see he was badly struggling. A simple change would have been to take off Hill for Eardley, shifting Baptiste to centre back – the defence that should have started the game – but alas the first half warnings went unheeded. Matt Hill is enthusiastic, experienced and based on historical evidence, a reasonable footballer at Championship level. However, there is a reason he has rarely been utilised in the centre of defence before joining Blackpool, and let’s hope it’s the last we see of him in that position – up against a big striker, of which there are lots in this league, he does not have the physical stature to adequately complete and it was a total failure of management to primarily play him there, and secondly not withdraw him when the faults were so glaring. It’s something of a worry that despite signing so many players, with another one arriving today in the form of Callum McManaman, there is an alarming lack of cover in central defence. One injury to either Evatt or Cathcart should surely not mean Matt Hill is next in line. There are of course other players who could have played instead, not just Baptiste who I’ve already mentioned. Chris Basham has been used at centre back both at Bolton and for Blackpool’s reserve / development squad side this season and last, but Basham appears to be far out Holloway’s plans, with a loan move likely. The return of Craig Cathcart against Doncaster will be a big relief. The start of the second half was the worst 10 minutes imaginable, and Blackpool only had themselves to blame. Some suicidal defending saw the offside trap repeatedly breached – Hill often at the centre of the problems but they were by no means isolated to just him. Evatt and Crainey both failed to step up at the necessary moment on separate occasions, and glances over to the linesman in hope of the flag going up were in vain. Sam Baldock was lively and it’s surprising it had taken him until this game to get on the scoresheet. A questionable offside decision and a selfish effort from John Carew when he might have passed were the only things that prevented Baldock from taking home the match ball. The ‘Pool defence did not have the pace or organisation to keep up with Baldock, and in combination with the aerial dominance of Carew over Hill, the floodgates opened. After the fourth goal went in, it did at one moment seem as if the final score was going to be five, six or even seven, but after a few near misses, West Ham did eventually take their foot off the gas and settle for just the four goals. Not that that appeased the visiting side, whose frustration was there for all to see, notably in the case of Alex Baptiste. Not content with a tantrum that saw him demolish the corner flag, Baptiste was lucky that the officials missed a kick out at the prone Papa Boupa Diop – had the referee seen this a red card could easily have been the result. 4. Lomana Lua Lua – more than a novelty act? Aside from the heroics of Matt Gilks who helped keep the score relatively respectable, the introduction of Lomana Lua Lua provided one glimmer of light for the travelling fans. Looking a little more rotund since he last graced these shores, Lua Lua arrived on the pitch as something of a circus act. A jovial chant which accompanied his every minute on the pitch seemed to spur him on however, and as a result he at least did depart the pitch with some credit to his name. He is surely not yet fully fit, his size alone indicates this, but he looked to have enough energy about him to suggest there is still some mileage left in him. He was content to run with the ball, take on players and be positive heading towards goal. It was of course all over by the time Lua Lua entered the field – why the substitutions took so long to be made is a question only Ian Holloway can answer – but Lua Lua did give the West Ham defence something to think about. Whether Blackpool should even be signing the likes of Lua Lua – a player out of contract unable to find a club elsewhere – when there should be huge resources available is an argument for another day. For now though, Lua Lua may well get a chance to prove people he can still do well in this country. I’m not convinced he can last a full game, or even 60-70 minutes, at this point, but with Billy Clarke and Matt Phillips loaned out to Sheffield United, he should get a chance to feature in the coming weeks. At half-time of Saturday’s game, a 5-0 scoreline seemed an unlikely outcome. ‘Pool had looked disjointed for the majority of the first 45 minutes, struggling to cope with the way Bristol City had set up. Keith Millen had sent his side out in a 4-4-1-1 formation, Brett Pitman playing off Nicky Maynard. In a defensive situation, this strategy helped the visitors stifle ‘Pool – straight from Matt Gilks’ goal kicks City were often happy for a Blackpool defender to receive the ball, dropping deep into their own half to crowd out the home team’s attacks. In contrast, City were causing plenty of problems for the hosts. The most obvious chance they had in the first half was the fine save Brett Pitman forced Matt Gilks into following a neatly worked corner, but Keith Millen’s side were also looking dangerous from open play. Pitman, who passed up the chance to play Premier League football with Blackpool last season to sign on at Ashton Gate, was finding himself in space time and time again. 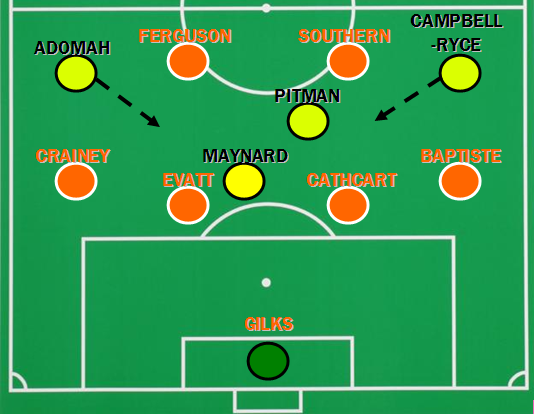 As the graphic above shows, Pitman was playing between ‘Pool’s lines, not being tracked by Barry Ferguson or Keith Southern or any of the home side’s back four. Bristol City’s two wide players – Albert Adomah and Jamal Campbell-Ryce – also drifted into this area and gave cause for concern. Clearly there was a lack of firm communication, neither the back four or the two holding midfielders took responsibility for picking up players between the lines and there were moments when ‘Pool almost paid the price. As illustrated below, Blackpool got the benefit of a close offside decision following a well-worked move when City exploited the space given. Pitman found himself with time on the ball and split the ‘Pool defence with a fine through-ball. Adomah got on the end of it and slotted past Gilks, but much to the relief of the home support, the flag went up. Gary Taylor-Fletcher’s goal separated the sides at the break with a helping hand from Dean Gerken (see point 3), but it’s hard to argue it was a justified lead. With just one victory in the seven matches preceding the encounter with Bristol City, the Seasiders had become a little too predictable in their play. Short, deliberate passing had become easy for sides to combat and the creation of chances had been at a premium. The success ‘Pool enjoyed last season was in no small part down to a nice blend between crisp short passing and an excellent use of the long diagonal. The tactic’s main proponent was the now-departed Charlie Adam, who had a range of passing unrivalled in the current squad. However, there does now seem to be a shift in the team’s mindset to attempt this high risk pass with more regularity. The first 20 minutes at Portsmouth saw a number of right to left long diagonals which more often than not sadly found the stands rather than a tangerine shirt – a lack of early success with the long diagonal at Fratton Park led to an abandonment of the tactic, but the following game at Coventry saw it brought back with more joy. Craig Sutherland had a goal unfairly chalked off for offside having got onto the end of a long diagonal before finishing cleverly, and Gary Taylor-Fletcher’s wonder strike was the result of a long diagonal pass from Ian Evatt. Coventry manager Andy Thorn was quoted after the game as saying ‘Pool’s usage of the long diagonal had taken him by surprise – a response that didn’t endear him to a section of his own support who accused him of not doing his homework. In defence of Thorn, the tactic hadn’t been employed regularly so far this season and the Coventry game marked a visible change in focus from Ian Holloway’s players who made great use of the long diagonal during the first half at the Ricoh Arena. This trend continued on Saturday against Bristol City, with the long diagonal featuring heavily again. It’s a tactic that has its critics, with some ‘Pool fans lamenting its use and insisting ‘Pool would be better keeping possession. However, there’s equally a case to be made that keeping possession is all well and good, but if the short passing doesn’t penetrate the opposition, is it really effective? The long diagonals do sometimes result in a concession of the ball, but used in moderation, it provides a way of keeping the opposition guessing – and with pacy players on the flanks there is always the chance a long diagonal can create a goalscoring opportunity. The pre-match team news from various media outlets speculated on whether David James would retain his place between the sticks, or if Dean Gerken would replace him. It’s been a turbulent start to the season for James – a man no stranger to dropping the odd clanger – but Keith Millen will surely be wondering what might have been had he not selected Gerken. Firmly in the game in the first half, and possibly even arguably having slightly the better of things, Gerken made a mess of a speculative Jonjo Shelvey shot, spilling the ball right into the path of Taylor-Fletcher who made no mistake from around six yards out. It was shot Gerken should have held, or at the very least been able to direct away from goal, but instead the City keeper handed the initiative to ‘Pool. 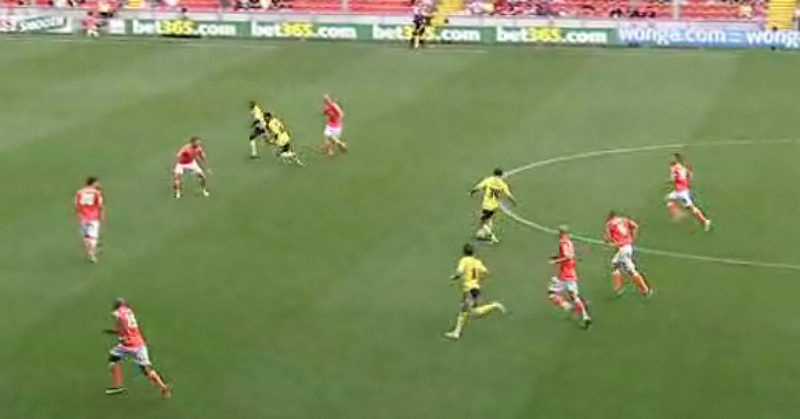 Not content with his first mistake, Gerken again should also have been able to prevent Blackpool’s second. Shelvey’s audacious free-kick made for a spectacular goal for home fans, but any keeper being beaten at that range is surely at fault. For Millen, his keeper’s errors then highlighted the weaknesses of his team. The confidence drained from the players in a fashion typical of a side languishing at the bottom and for the first time this season, Blackpool pressed home an advantage. Bristol City lacked a leader on the pitch and heads dropped – from a position of being competitive for over half the match, by the end of the game ‘Pool were rampant and the full-time whistle was a welcome sound for the visiting side. Under Millen’s stewardship, City have obviously had a hugely disappointing start and after holding onto a player of Nicky Maynard’s calibre their fans would reasonably have expected more. With the pressure already building, a 5-0 defeat was only ever likely to end with one outcome and Millen became the second managerial casualty of the weekend. Whoever replaces him has the foundations of a team to build on – the first half performance showed that much – but a tough season looks inevitable. The closing of the transfer window at the end of August left a significant number of Blackpool fans disappointed. Many felt that the squad was missing two quality players who could make an immediate impact on the starting XI – an attacking midfielder and another forward. The wait for an extra striking option goes on, but the loan acquisition of Jonjo Shelvey is a real coup. Filling the void at the tip of the Seasiders’ midfield, Shelvey looked right at home on his debut. With Elliot Grandin injured, ‘Pool had been sorely missing a player to link the midfield and attack. Many of the midfielders at the manager’s disposal are more suited to a deeper role, and the one other player in the squad who could fill the role behind the front three – Gerardo Bruna – seems to be some way off breaking into the first team. Shelvey seemed the perfect answer, and expectations following the announcement of his move were high. Needless to say, a thunderous goal from a free-kick and a couple of assists ensured he did not let anyone down, but repeating that level of performance during his spell could be critical in deciding whether ‘Pool climb the table. Shelvey should provide goals, a willingness to run at the opposition and no shortage of energy based on his first outing. It’s still early days, and Shelvey’s ability to shine at this level will be tested to the full in Blackpool’s next game, away at West Ham.